What is Faith in the Future Foundation? To print this chapter in flat-letter format, click here: Preface Requires free Adobe Reader. Ancient calendars from civilizations found around the world are designed to end one point in time. They communicate an urgent warning to every person alive today! Complex bronze and gold clocks with multiple dials or faces are found in museums around the world. Why they have such advanced intricacy has stumped scientists for hundreds of years! In this book, you will learn why the ancients built so many pyramids, observatories as well as those complex gold and bronze clocks with more than one dial. It surprised me greatly to discover that many ancient calendars converge on 21 December 2012 in one way or another. It amazes me that ancient cultures separated by thousands of miles of geography and thousands of years in chronology agree so precisely in the cyclical nature of time, history and prophecy, which is history written in advance. The most famous example is the Mayan-Aztec calendar, which ends its 25,626-year cycle on that momentous date. Some researchers have also found 21 December 2012 in what is called, the Bible Code. Using very different research methods, I independently discovered it in the Bible’s book of Revelation and Daniel’s prophecies. It is one of the most important dates in the plan of God for all humanity! You can read about them in my earlier Babushka books, Apocalypse Prophesied and Mystery of Tammuz 17. What I learned in researching those first two books led me to discover mysterious bronze and gold clocks exhibited in various museums around the world with multiple dials marked with strange patterns that cannot be compared to anything we use today. Scientists were not able to guess their purpose. Some think these clocks were mere calculators for tracking the present paths of the sun, moon, planets and some stars, but these mystery clocks do not fit our present set of zodiac constellations or what has been observable in the sky during recent history. Some of these ancient mechanisms were made from solid gold too heavy for one man to even carry! This fact raises the question of what was so important to cause the ancients to spend a fortune on calendar clocks. Furthermore, their complex design functionally demands a rational explanation beyond our present astronomical context. Clearly, keeping track of the changes in the sky was not simple, but also very important to the ancients. All clock-like mechanisms show very complex design features, which amazingly also correlate with ancient pyramids and outdoor observatories found around the globe that are similar to the famous Stonehenge in England. The immense expense and advanced technology invested in these valuable mechanisms and observatory-temples indicate their importance to past civilizations. These amazing artifacts and structures from antiquity have stumped scientists for hundreds of years. Even using today’s modern computing equipment does not produce commonsense explanations because modern scientific research is based on the false premises of uniformitarianism. Furthermore, most scientists selectively reject any ancient documentation that does not fit their theories. In this book, you will learn how these clocks work and why the ancients built so many pyramids and observatories as well as why those complex gold and bronze clocks needed more than one dial. The Bible gives us reliable observations about the past that supplement what science can tell us. Scientists extrapolate backwards in time assuming that the manner of the earth’s movement through space during antiquity was like it is today. The Bible points out that we do not really know how it was and gives us vital clues that can be combined with science to provide a more stable, two-rail track system for the railroad train of understanding to travel. In these verses, the Bible states that at one time the earth “tottered” or wobbled like a drunken man in its orbit. This verse is positioned just before the description of the Genesis Flood waters reaching over the mountain tops. Forget the list of details like how the mountains were probably lower in height back then, focus on the main message. What caused the tottering? What does that have to do with the Flood? What I propose is controversial. You will not find it explained in schoolbooks or libraries, university research departments or anywhere else because modern science hypothesis and postulates that the earth’s orbital movements around the sun have not changed for billions of years. That faulty belief system keeps these ancient clocks undeciphered. It is common knowledge today that the earth moves through space on two axes: 1) it has an orbit around the sun in 365.24-day; and 2) it has a tilt axis of 23½° angle within 24-hour day rotation with a fixed axis. Of course we assume both numbers to be trustworthy but in ancient time mankind measured time a little differently. This book presents evidence that a major asteroid impact took place on 5 February 2287 BC that changed how people counted time in calendars. It affected the length of counted years and the solar radiation variables that determine the earth’s seasons. The asteroid strike initiated a wobble in the earth’s spin-through-space axes that even caused the sun to rise in the west at times! My hypothesis states that there was a third axis in the past that spun the earth on its plane of solar orbit much the same, horizontal way a top spins on a smooth, flat surface when it slows down from spinning upright on its point. I am not trained as an astrophysicist, geologist, archaeologist or theologian. I am a proficient applied scientist and prolific inventor of high-tech products. I am capable of taking a rational look at scientific evidence exposed for all to see. I hope that my ideas will be evaluated by trained professionals in these fields. I have limited my researched information to keep it short. At my advanced age, I do not have the time or resources to do the supplemental scholarly research required to test my thesis. Meanwhile, I share my ideas with the public for you to consider and perhaps pressure the academic world to come around with a better explanation for the data than the conclusions presented in this book. My chronological proposal is not based on the theory of evolution which cannot solve the paradox presented by the many embedded geological and archeological facts that seem to contradict modern ideas about the past. I wanted to find answers to mystery clocks and calendars and determine why the ancients invested so much time and expense in pyramids, big observatories like Stonehenge and building complex mystery clocks. It all points to a relatively recent asteroid impact never reported in history books in conflict with an atheistic fairytale evolution theory religion that changed how the earth moved through space around the sun. My research has convinced me that an asteroid struck the earth on 5 February 2287 BC. This strike caused the earth’s center of gravity and magnetic fields to shift resulting in the present tilt of the earth’s axis at 23½˚. Genesis describes similar events in Noah’s time. That’s how I got started on this study. I never thought that Jesus was so precisely accurate when He said that the future Apocalypse would be like Noah’s day, but when I counted back one month and 17 days from the beginning of the 40 days of rain, I came to the solstice date of 21 December 2288 BC. It matched the solstice date of 2012 determined by separate calculations presented in my books Apocalypse Prophesied and Mystery of Tammuz 17. What a coincidence! I concur with scientists who believe that an asteroid strike close to the equator in the Gulf of Mexico caused a massive extinction of dinosaurs, but I disagree with their date of 60 million years ago. Other scientists have wondered about the magnetic abnormalities around that area and some link it to a magnetic black hole within what is popularly known as the Bermuda Triangle. This magnetic vortex has been the subject of dozens of TV programs about ships and airplanes unexplainable disappearing while passing through. It is not too difficult to imagine a big asteroid strike from space strong enough to make the earth wobble like a storm-battered boat with its ballast disturbed. The after effects of such a strike would last for centuries. In fact, they did and to a small degree, still impact how the earth moves through space. Aztec calendar cycles and records found in Genesis indicate that the earth’s rotational axis moved in pendulum-like wobbles even as it roughly continued in its same annual orbit around the sun. Ancient calendars were designed and maintained by priests. They marked time by counting a four-step sequence of solstice, equinox, solstice and equinox to determine a year. Each of these events marked some change in the seasons. The asteroid strike messed up what had been an orderly process that marked years of 52 days with about 7 “years” passing for each orbit of the earth around the sun. If a year was 52 days, a season was 13 days, so seasons were not as meteorologically extreme as they became after the asteroid strike. Before the asteroid, the whole earth was like a tropical paradise. Afterwards, it became critical to know when and what to plant in order to produce food. The earth’s unpredictable wobble is the ancient reason why archaeologists find so many early observatories made of megaliths. 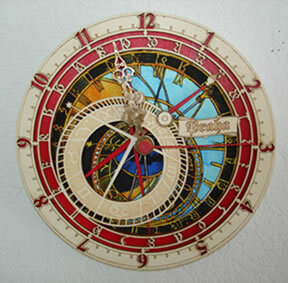 More advanced societies followed pyramids and stone observatories with metallic mystery clocks designed with three dials. They had to measure movements in the sky and changes of climate that had become difficult to calculate due an unwinding third spin axis (the mysterious X-axis). The wobble set off by the asteroid strike gradually reduced from residual, prehistoric spin of 2.82 to .546 until it ended with today’s fixed 23½° daily rotational tilt (the present Y-axis). I have constructed a spin-axis table to track this history of perturbations or wobbles. Admittedly, it strains our present-based conceptions to consider that the sun sometimes moved from west-to-east across the heavens in antiquity. I believe that it in fact reversed itself two times and a half time over a range of 1,800 years until it ended with what we can observe today. This means that the length of daylight varied from 16 to 28 hours in a manner similar to the movements of the sun at midsummer’s midnight sun as seen from northern Norway. I will describe how Chinese and Persian Astrolabe clocks prove this part of my theory. These dramatic changes in the natural order inspired tremendous human efforts to mark the passing of time nearly impossible to track as five pyramids on top of each other prove in the outdoor museum Mexico City. It was the age of building pyramids around the globe like Stonehenge and other giant calendar stone monuments. 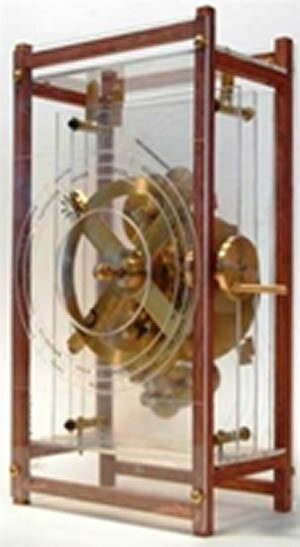 My proposed earth wobble caused the ancients to built intricate mystery clocks made of bronze and gold to measure different spin axis positions as solstice-to-solstice cycles were at times impossible to measure in a moving or vertical earth axis. Museums spotlight these wondrous artifacts, but their curators do not understand that they measure zodiac and sun cycles that switch depending on the pendulum direction mentioned above the earth still orbiting within a 365.24 day for a year around the sun (a relatively stable Z-axis). But for me the greatest discovery is how all of these diverse testimonies of artifact calendars, monuments and clocks relate to the documented Aztec precession of the equinoxes in the starry sky. My theory is totally new. The Aztec calendar records a frozen-in-time precession of 5,125 cycles after the asteroid impact that I relate to the beginning of Noah’s Flood. The Hebrew calendar evidences the same calendar cycles when it gives life spans of 900+ years to those who lived before the Flood. Since it is biologically impossible for people to live this long, I concluded these “years” were pre-Flood calendar cycles seven times must be shorter than today’s. In other words, it took 7 pre-Flood cycles to make one of our present year cycles around the sun. I concluded that a third spin axis (X) testified by ancient astronomical notations that describe the earth’s progression through 24 zodiac constellations instead of today’s 12 monthly signs. This is why ancient clocks had three dials like the Antikythera bronze mechanism. They needed those three dials to track the three spin axes instead of the single clock face we now know. The mystery clocks of antiquity estimated that the pendulum wobble of the earth’s axis would end its parabolic time journey in 2012 because the speed of light is not constant according to advanced scientific theories. This fact alone was only recently discovered by physicists and connects Einstein’s theories of relativity to the Second Law of Thermodynamics known as entropy. The theory of intelligent design together with recent GMO and DNA technologies expose an atheistic evolutionary theory as being unscientific unless you make it into a religion. My conclusions clash with present red shift theories based on the assumption of an expanding universe, which is not very logical when compared with my hypothesis, which scientifically supports a shrinking universe that is getting colder. That fact is verified in other ancient literature rejected by the academic priesthoods of modern universities, who oppose any facts that strongly point to a Creator being responsible for and in control of the earth’s destiny. You be the judge. In this book, I also refer to a new discovery, the Hebrew Alphabet Number System [HANS]. It is a Hebrew code connected with the biblical Rosetta Stone that reveals God’s plan for humanity with preset clock cycles. I described them in detail with many other analytic tools in my two books Apocalypse Prophesied and Mystery of Tammuz 17. I encourage you to read these books because they reveal many dates for important future events that will affect you personally. Check out my new discoveries in this book. You will never hear them at universities or preached in church! All Scripture quotations, unless otherwise noted, are from the HOLY BIBLE: NEW INTERNATIONAL VERSION®. NIV®. Copyright © 1973, 1978, 1984 by International Bible Society. Used by permission of Zondervan Publishing House. All rights reserved. Scripture quotations marked nrsv are from the NEW REVISED STANDARD VERSION BIBLE. Copyright © 1989, Division of Christian Education of the National Council of the Churches of Christ in the United States of America. Used by permission. All rights reserved. Scripture quotations marked nasb are from the New American Standard Bible®, Copyright © 1960, 1962, 1963, 1968, 1971, 1972, 1973, 1975, 1977, 1995 by The Lockman Foundation. Used by permission. Scripture quotations marked kjv are from the HOLY BIBLE, KING JAMES VERSION. The ideas, teachings, implied theology and biblical exegesis presented on these pages represent the beliefs and opinions of Herbert R. Stollorz, the author. They do not knowingly represent the positions of any organized church, ministry or spiritual movement. Neither do they represent in full the teachings or objectives of any political organization or social movement known to us. The Bible is God’s Word, the divine revelation of His will and purpose for life. Jesus Christ is the only way of salvation by faith. Faith in the Future Foundation considers itself a delivery service for the good news of God’s coming kingdom without respect to persons or organizations. Faith in the Future Foundation teaches that a believer's "citizenship is in heaven." The directors do not endorse or work for any national or international political party or government, military operation, or specific religious denomination. We do not support or undertake any type of forced conversion or change of religious and/or philosophical beliefs. Jesus Christ alone can rightly judge the mortal heart and determine a person's spiritual condition and future in eternity. Faith in the Future Foundation does not initiate, support or encourage anyone to participate in any activity that seeks to bring biblical prophecies to pass in this world and time. God is Almighty and able to bring about His prophecies without dependence on human imagination or activity. Our recommended course of life is to obey God above all and so far as it depends on us, to live in peace with all persons.